"Old Library Building, Quitman, GA" by George Lansing Taylor Jr.
Old Library Building, Quitman, GA. 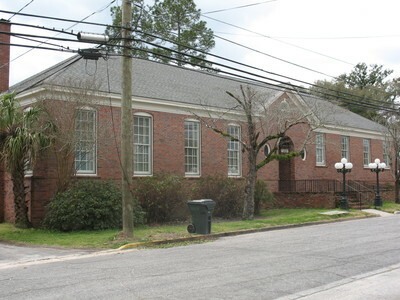 The Old Library Building in Quitman, Georgia, was designed by the famous architect Lloyd Greer and was constructed in 1933. The City of Quitman owned the building and sold it to Community Clubs, Inc. This group comprises the 13 local civic clubs who joined together to save the old Library Building and create the Historical Museum. It now houses the Brooks County Museum & Cultural Center. Taylor, George Lansing, Jr.; Lance Taylor; Photographers -- Florida --Jacksonville; Photograph collections -- Florida -- Jacksonville; Old Library Building; Brooks County Museum & Cultural Center; Lloyd Greer -- architect; Brooks County (Ga.); Quitman (Ga.); Libraries -- Georgia -- Quitman.